When Regina Chung saw a home for sale in Windsor Square in 1984, she had barely ventured into the neighborhood, mostly admiring its tree canopy-lined streets from afar. Interest rates were a whopping 18 percent, but Regina and her husband Jim were undeterred, and with help from relatives, they were able to raise enough money for the down payment. Chung had immigrated from Korea a few years earlier and didn’t know about U.S. real estate rules and policies, she explains, still laughing about the incident. 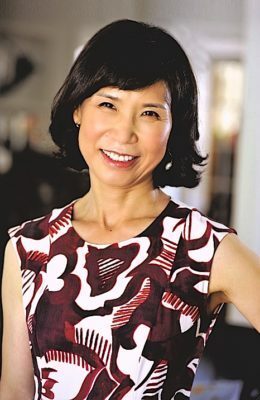 Her good nature and sense of humor have served her well in her new country and also on the board of the Windsor Square Association, where she serves as liaison to the Korean community. “She’s an outstanding board member. She’s the kind of person who will volunteer to do anything… and she adds her own perspective,” said WSA president Larry Guzin. “She’s always ready and willing to help,” echoed longtime WSA board member June Bilgore. Chung would eventually earn a real estate license and worked at Better Homes & Gardens Realty, formerly on Larchmont, and further up the street at Coldwell Banker North — where she was named Rookie of the Year. She also earned a tax professional license. She and Jim raised two children at the home they moved into all those years ago on Lucerne; and now welcome their two grandchildren to the site. Regina would eventually leave real estate to run a teriyaki lunch restaurant downtown, managing a 10-member staff. When her father became ill, her travels to visit him in Korea changed her life course. After he died, grief-stricken, she volunteered at her church and started a four-year stint at Cedars-Sinai Hospital, where she brought magazines to patients. She never dreamed she would leave Korea when still a student in Seoul or after graduating with masters degrees in Korean and German, and even after friends introduced her to her future father-in-law whose son lived in the states. When he showed her a photo of his eldest son, “I didn’t like him,” she says. She wasn’t ready to get married, she explained. Her future father-in-law persisted. “I was his #1 choice,” she laughs. Finally, she agreed to meet his son. The meeting went well. “But I still didn’t like him,” she laughs again. Regina smiles about it today; back then she agreed to an engagement, and thus began a long-distance courtship, as Regina lived in Seoul, and Jim’s family had immigrated to Los Angeles years earlier. “He wrote me letters every day,” she says, still touched by his correspondence. Jim, an engineer with the city Dept. of Water and Power, and Regina have remodeled their home three times in all, including the early escrow snafu. Her experiences have taught her not to take things for granted. She watched after the Los Angeles riots as area residents coordinated with the police to help secure the neighborhood, and she has witnessed the benefit of local government. Changing the city, the county and the nation starts with small steps, she says. As a WSA board member since 2009, she learned the area’s historic architecture, tree-lined streets and family friendly neighborhood were not a coincidence. The area’s charms were the result of the efforts of neighbor volunteers who have worked to protect and beautify the area. “From the first sight I fell in love with my neighborhood,” she says.